Resisting Inertia | slowing down, but not stopping. slowing down, but not stopping. Nights like these, I struggle. There are so many things that were ‘ours’. Places, music, inside jokes. I can’t listen to Andrew Bird without wanting to throw things. I can’t watch Star Trek or Big Bang Theory or Walking Dead without feeling ill. I catch myself giggling at something and realize there’s no longer anyone that understands why it’s even funny. It still hurts to breathe, nearly three months later. I put up a pretty good front. Most of my friends kinda figure I’m long since over this phase of things. I don’t bother confiding because most of them never knew ‘us’ well to begin with. Most days I’m fine and then nights like these… I lose it. The worst part? I know it’s a one-sided struggle. He moved on before he ever even told me goodbye. I’m now 32 years old. Yesterday’s birthday was a very, very hard one to take. I’m now living alone, for the first time in years. Infer from that what you will. I’m realizing who my real friends are, something I probably could have figured out a long time ago if I would have opened my eyes. I’m entering into a period of change that I don’t want — if I could fight it with every bit of my being, I would — but that I know has to happen for my life to keep moving forward. I’m scared, I’m angry, I’m bitter, and most of all, I’m just completely confused. I know, I know, pick up your dropped jaws. I’ve returned. I missed you, too. 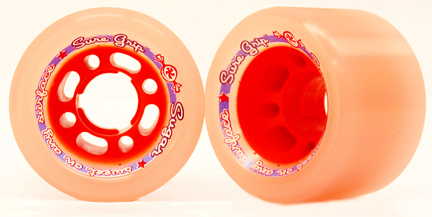 Mostly, I popped back in to have a place to put together my version of a holiday gift guide – this one, for the one thing that has completely taken over my life in 2009… roller derby. This guide is for anyone from aspiring newbies to seasoned vets, and every player in between. Don’t skate? Maybe this will persuade you to lace ’em up and give it a whirl! 1) Skate Snouts. From Demonica with Gotham Girls Roller Derby, they’re customizable – pick your team color and add a cute cutout or design! 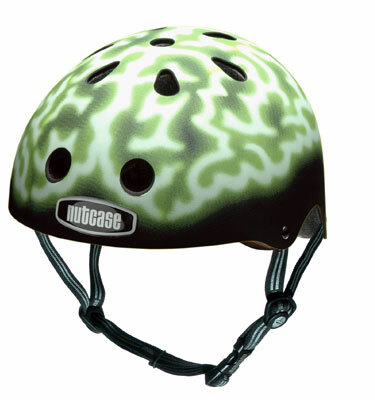 3) Nutcase helmets. Sure, you can rock a plain ol’ Pro Tec or S-One, but wouldn’t you rather protect your brain in style? The xray brain one is my favorite. 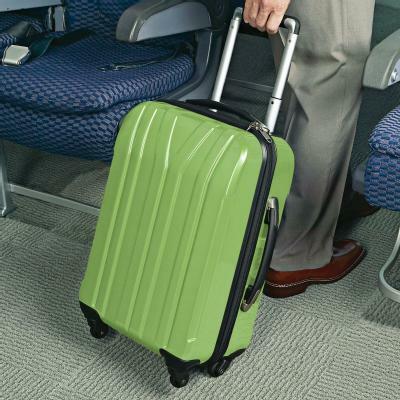 4) Brookstone Dash Rolling Suitcase. Let’s see… stylish? check. Utilitarian? Check. Able to stow multiple layers of foul-smelling pads and gear? Check. Rolls on all four wheels? Check. And you don’t have to haul it over your shoulder! 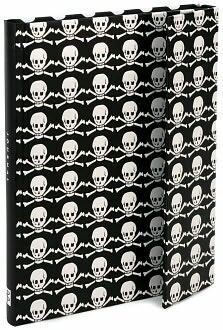 5) Skull & Crossbones Journal. Roller derby’s not just skating – it’s committees, organization… a real business, for the skaters and by the skaters. Keep your derby stuff organized in a journal that’s hard to lose. 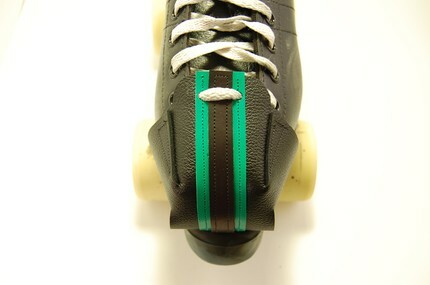 6) Wicked Skatewear derby shirt. Any one of the many, really. Being a derby skater means collecting a drawerful of derby-related tshirts; in-jokes, other teams, and maybe even the coveted post-bout shirt swap with that gal who knocked you three deep into the suicides. Derby love, baby. 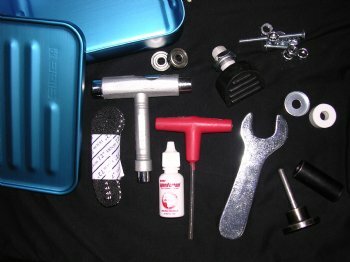 7) Fast Girl Skates Emergency Tool Kit. Perfect for stowing under the team bench during a bout – how many times have you had to scramble for a toe stop wrench or a spare set of laces? Never? Well, trust me – when it happens to you, you’ll wish you had something like this handy. 8.) 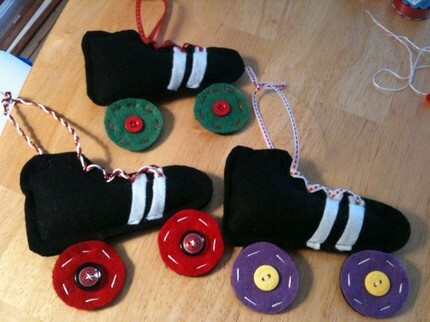 Felt Skate Ornaments. Decorate your tree in style and donate to a good cause at the same time. 9) Sigg Large Capacity Water Bottle. With thirty bottles lined up against a wall at practice, you want to make sure yours is unique, or at least easily recognizable. This bottle is much prettier than a piece of green duct tape slapped over a Dasani bottle, don’t you think? 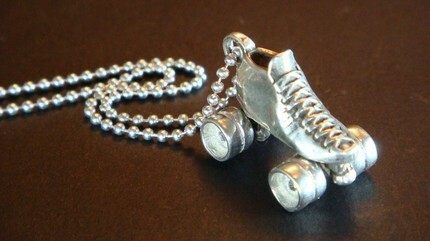 10) Tru Luv Tool Company Silver Skate Charm. Created by Jacquelyn Hyde with the OC Roller Girls, this is the most realistic derby skate charm out there – believe me, I’ve looked! Be the envy of all the skaters on your team with this beautiful piece of jewelry. Yeah, the title’s from Tommy Boy. Shameless ripoff, right? Well, it’s exactly how I felt at the running store last weekend. A little history: for those of you who don’t know, my friend Laura convinced me to run the 500 Festival Mini Marathon this year. After a lot of cajoling, convincing, and positive reinforcement, I agreed. And as January started to coast by in ice-covered glory, I decided it was time to get some gear. My first (ever!) trip to the running store started out great. The very helpful folks put me on a treadmill to check my stride (turns out I’m a pretty straightforward runner — who knew? ), got me hooked up with some great shoes, and recommended some accessories. But then, when I decided to splurge on a running outfit, I realized that I was at least six sizes larger than the biggest women’s gear they stocked. Now, I understand that you want to cater to your core audience. I’m very certain that the vast majority of runners that frequent this store are much, much smaller than I am. I’m a big girl, and I know this — hence the motivation to, you know, RUN. Vicious circle, isn’t it? Not knowing where to turn, I asked my aforementioned friend what she would recommend. And lo and behold, I received an incredible amount of responses from runners who had the same problems. I was able to generate a shopping list online from places that cater to larger athletes. And you know what? I bet those places make a KILLING. Note to neighborhood running store: YOU ARE MISSING OUT. I’m waiting on my new gear to arrive and getting ready to start a training program on Jan 20th. I have no idea what to expect, but at least I’ll be wearing a coat that fits! it slices! it dices! it juliennes! Those of you who know me well know that I cannot cook. As in burning water, out-of-a-box, drive-through-window CANNOT MAKE FOOD. One of my resolutions this year is to start using the kitchen for more than a place to store my beer and Eggo waffles. In that vein, I’ve started accumulating things that one might need in order to make meals, such as pots, pans, spatulas and even measuring cups. The crowning achievement, however, was over Christmas when I received… wait for it… A Cuisinart food processor and mandolin slicer. And now I’m the Barefoot Freaking Contessa. In the past few days, I’ve made (not from a box or a can, but actually PIECED TOGETHER FROM SCRATCH): broccoli/cauliflower soup, aloo gobi, poppy cheddar seed crackers, roasted red pepper and feta spread, falafel, tzatziki, vegan chocolate cupcakes and lasagna. I don’t know what kind of light bulb finally went off in my head, but there’s just this feeling of accomplishment you get from pulling a dish out of the oven that originated in your brain, not a plastic container. Someone should have told me about this before I spent the better part of my twenties living on Spaghettios and Fudgesicles. I have NOT gotten into the Giftmas spirit this year. In fact, today was the first day that I bought anything for anyone in my family (online, no less), and honestly? I’m nearing the point where I may do what I’ve never done before… and just get gift cards. I strained my back at practice, so getting in my car and braving the traffic isn’t happening any time soon. I’m giving the holidays a big fat ‘meh’ this season. I don’t know what’s different this year. All I know is I’m tired of it already. Last night, I coached my first official roller derby practice. No, I’m not giving up my role as a skater – I like hitting people way too much to give up now. 😉 Instead, our league is trying out a coaching by committee concept. And I really love it! About a half-dozen of us are alternating running practices. It’s teaching us to respond and react to different types of direction, as well as highlighting the different skill sets of the committee coaches. Me? I’m not a hardass. I love strenuous workouts, but I don’t love yelling. I’m a firm believer in the ‘catching more peas flies (thanks, Jason) with honey than you do with vinegar’ mantra. So my first practice last night focused on drills that had an element of humor to them. On a blustery, cold, rainy, no-one-really-wanted-to-be-there night, I think it worked out pretty well. Our last activity of the evening (before core and stretching) was Queen of the Rink. Each skater for themselves. Knock a skater out of bounds or on the ground, and they’re out. (legal hits only, of course. ) 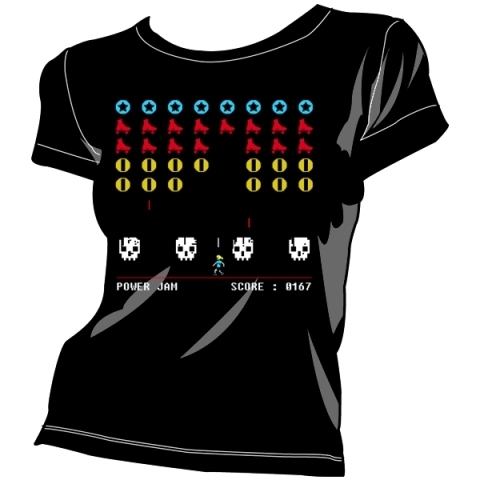 Last person standing wins. I was feeling SO good about myself, having weathered a couple of awesome hits – and then a can-opener type jab to my chest completely laid me out. Note to self: when you feel yourself getting cocky, BEND YOUR KNEES. 😉 Because at that point, someone’s gunning for you.